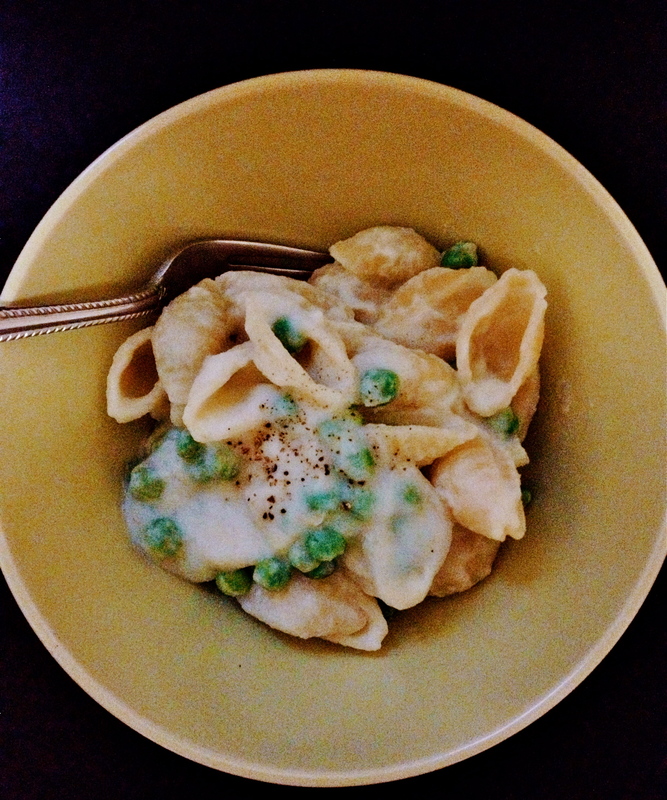 I recently made the Peas and Shells Alfredo from the Smitten Kitchen Cookbook. Of course, it was outstanding, and dinner was ready by the time the shells finished boiling. I try, however, to save a heavy pasta cream sauce for those special comfort dinners. Today’s recipe is a riff on that heavier sauce. There’s still shells, there’s still peas, but no cream! 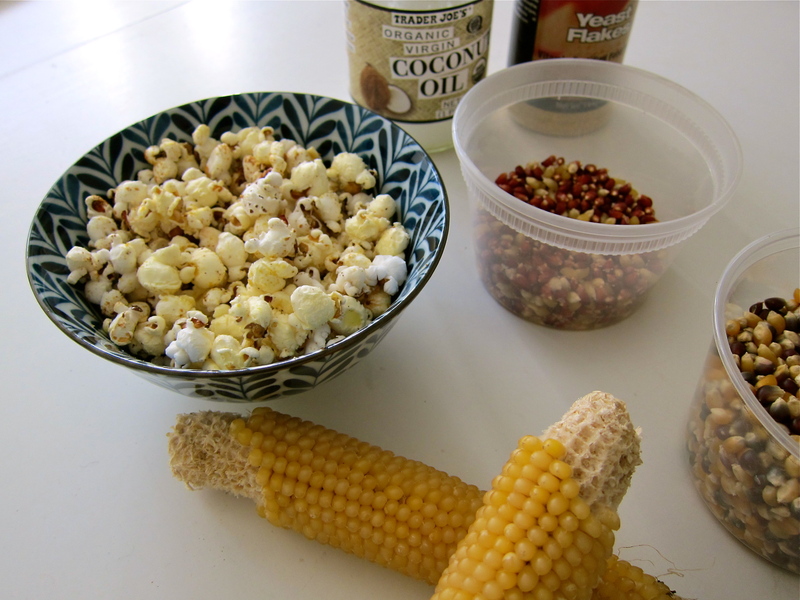 The sauce is thickened with boiled and pureed cauliflower, and wow is it good. Cauliflower is part of the cruciferous vegetable family, along with broccoli, kale, collards, and cabbage. It is a rich source of vitamins C and K, thus providing antioxidant and anti-inflammatory benefits! You can read more about cruciferous veggies here. To make this pasta sauce, cauliflower gets boiled and pureed in a blender with milk (you could use non-dairy milk to make the sauce vegan). Added to a saucepan with some nutritional yeast, a little garlic, salt, pepper, and a dash of hot sauce, you would never know there was a vegetable hiding in all of that goodness. **NOTE: I recommend preparing the sauce and saving leftovers in a tupperware. Cook the pasta as needed, to order. It tastes fresher. Bring a large pot of water to a boil. While the water is heating up, chop the cauliflower into florets. Boil the cauliflower for 15 minutes, or until very tender. Strain the cauliflower. In batches, place the cauliflower in the blender with the milk (I did this in 2 batches). Blend until very smooth. Pour the mixture into a saucepan over medium heat. Add the garlic, nutritional yeast, and salt and pepper to taste. Bring some more water to boil and cook your pasta until al dente (if using frozen peas, add them to the boiling water during the last 2 minutes of cooking). Combine the pasta, peas and tomatoes, and sauce. Toss with your favorite accouterment and enjoy! With a chill in the air and the leaves blowing, there is nothing like a cozy pasta dish to rear in the season. This baked pasta casserole is almost, but not exclusively, vegan. The non-vegan part of the dish comes from using a bit of butter to make the roux, as well as some nonfat dairy milk (you could easily use vegan margarine/butter and unsweetened soy, almond, or rice milk). 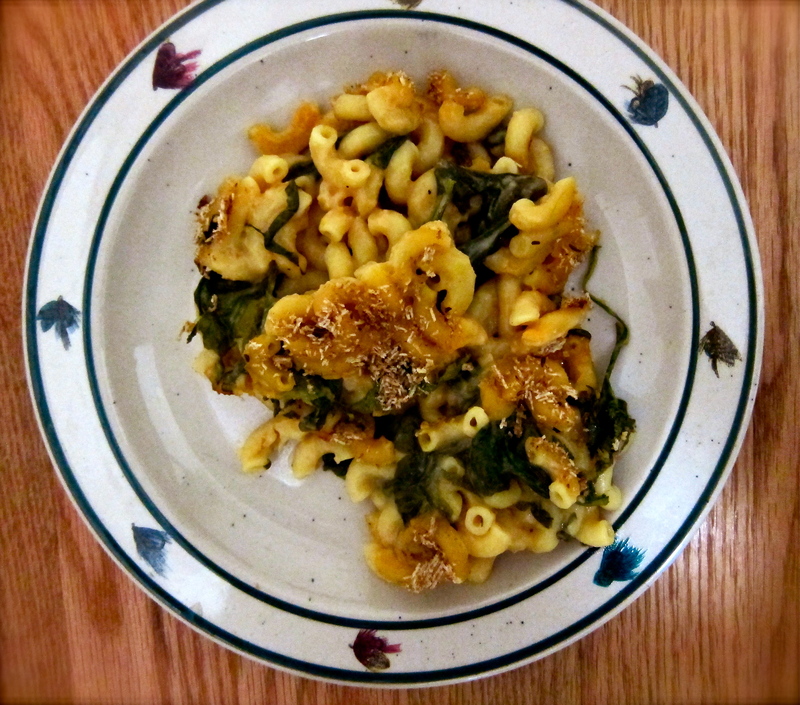 BUT, instead of cheese, I used nutritional yeast. All hail nutritional yeast. Gettin’ in some B vitamins and protein with significantly less saturated fat and cholesterol than your typical baked mac. There’s a dash of tomato paste (I already had some in my freezer ready to go) and a bit of garlic powder, with a squeeze of lemon and a splash of agave. These flavors come together and taste just. like. cheese. There’s also some spinach in the mix to balance this carb-tastic meal with a vegetable. What’s that crazy-looking stuff on top? Triscuits. I had the crackers laying around and they added a great salty crunch. You could crush up any cracker you like, or you could use bread crumbs for a more classy aesthetic. 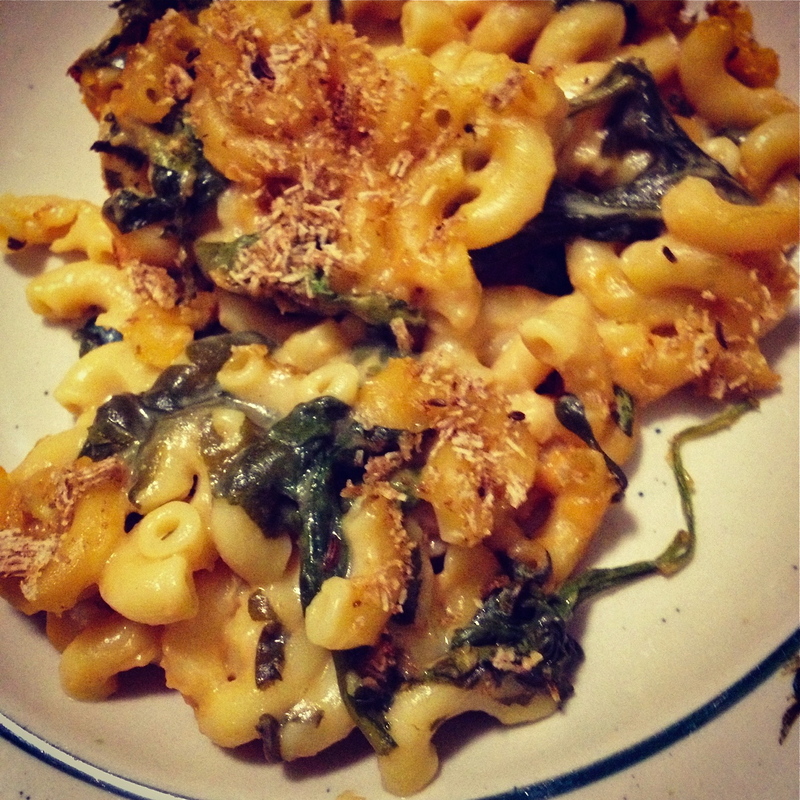 I shared a vegan mac n’ cheese recipe on the blog before, but I think this one is way better. I just prefer baked mac…creamy and crispy all in one. You may also want to check out this Vegan Fettuccine Alfredo that I made from Chloe Coscarelli’s cookbook. I kid you not, it tastes like traditional fettuccine alfredo. Vegan magic! Preheat the oven to 350 degrees F. Lightly grease a 9 x 13 inch pan. Bring a pot of salted water to a boil. Cook the macaroni according to the package directions. Drain and return to the pot. Meanwhile, make a roux by whisking the butter and flour over medium heat until the mixture forms a paste. Add the milk, and keep stirring to avoid clumps. Add the nutritional yeast, tomato paste, garlic, salt, and pepper, and bring to a boil, stirring frequently. Reduce the heat to low and let simmer until the sauce thickens. Stir in the lemon juice and agave. Toss the noodles with the sauce and the spinach and transfer to the prepared baking pan. Sprinkle the crushed crackers or breadcrumbs on top of the pasta and bake for 30 minutes, or until the top is lightly browned and crisp. Remove from the oven and let rest for 5 minutes before serving. Make Ahead Tip: Chloe says that the unbaked macaroni and cheese can be refrigerated for 2-3 days until ready to bake.